NEW and IMPROVED: FLEX EXTRA STRENGTH... FLEX ES ! 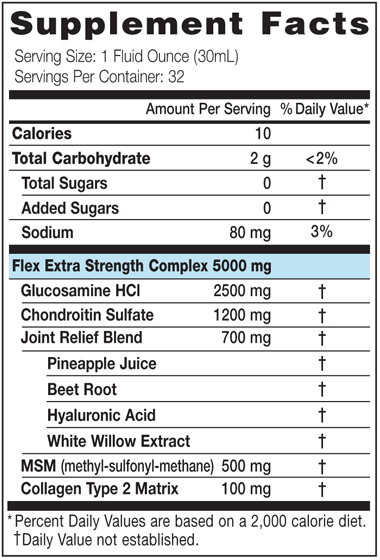 Always striving to bring you the best nutritional supplements available, our FLEX is now FLEX ES – FLEX Extra Strength. Other Ingredients: Purified water, citric acid, natural flavors, sorbic and/or benzoic acids (protect freshness), stevia, monk fruit, xanthan gum. LOADING: 1 serving twice daily for 2 weeks. Shake well. May combine with 8 ounces liquid. STORAGE: Avoid excessive heat. Refrigerate after opening. CAUTION: Do not consume if seal is broken or missing. Do not consume if allergic to ingredients. As with all dietary supplements, contact your doctor before use and also if taking prescriptions, have ongoing medical conditions, pregnant, nursing or under age 18. Isolated minerals or nutrients are best taken as part of a well balanced diet and broad supplement program. KEEP CAP TIGHTLY CLOSED. KEEP OUT OF REACH OF CHILDREN. Nice job on the improved flex. My joints are so happy. I actually walked around the lake today. Knee was giving me pain ocassionally. So I started taking the Flex and half way through my second bottle..my knee felt so much better. Today I still take Flex and my knee feels great. I have been using Flex for 6 months plus and I truly feel a difference. My knees and hips are where I have noticed the greatest change. Highly recommend this product! Joint Flex is excellent for flexible joints and motion. I like how the liquid form makes it easy to take and easy to absorb. Great for when you age or if you have joint wear. Joint Flex is the only product I've tired that has helped my joints and my sciatic nerve. I can walk in comfort. Joint Flex is easy to use. The liquid is easy to take with an interesting flavor. This is something I need as I age. I have trouble with my knees. I decided to start taking this for any help I could get. I have been taking this for about 2 weeks and am very happy with the results. I'm 47 and I do Olympic and Power lifts as part of Crossfit which can be rough on all the joints. My wrists and ankles have historically been tight and would be somewhat restrictive during lifts. After taking Flex for about a week I noticed a big difference in my mobility and much less discomfort. I take it everyday now. Great stuff! I was taking glucosamine and chondroitin pills in the past but didn't really notice much difference. After I started taking your liquid product, I was so happy with how my joints started feeling. Guess I just needed to find yours. Really glad I did. I take it every day now. I like that it has Type II collagen. I have felt a difference with my knees since I've been taking the liquid joint. I'm pleased that I am able to take this product.